Home / china / eBike / Fish / Frogs / How Stuff Works / Interesting / Motor / Scooter / Tip of the Day / How an eBike (electric scooter) wheel works, colored frogs, and fat fish with small fins. Adventures in China. How an eBike (electric scooter) wheel works, colored frogs, and fat fish with small fins. Adventures in China. On an afternoon stroll in China I saw a few interesting things that I thought would be fun to record on video. It is not everyday that you see the workings of an eBike motor, see colored frogs, or see fish that look like they came straight from a cartoon show. Having lived in China for the past four years, I have always been a bit curious how an electric bike/scooter works. If you look at the rear wheel of an eBike, you can see that it is different. I always suspected there were gears inside or something like that. Turns out, it is much simpler. Take a look. As you can see from the video, an eBike wheel is simply one giant motor with tires on it. Cool beans! I have no idea why the wheel was cut half way open, or why it was in water, but I was very happy to see such a cool thing. Electric bikes are quite amazing for how cheap they are! As I continued on with my stroll I came to a market where they were selling small pets outside. I saw some frogs and instantly thought they were toy frogs because of their unusual color. Once they started moving, I realized that they are indeed real frogs. 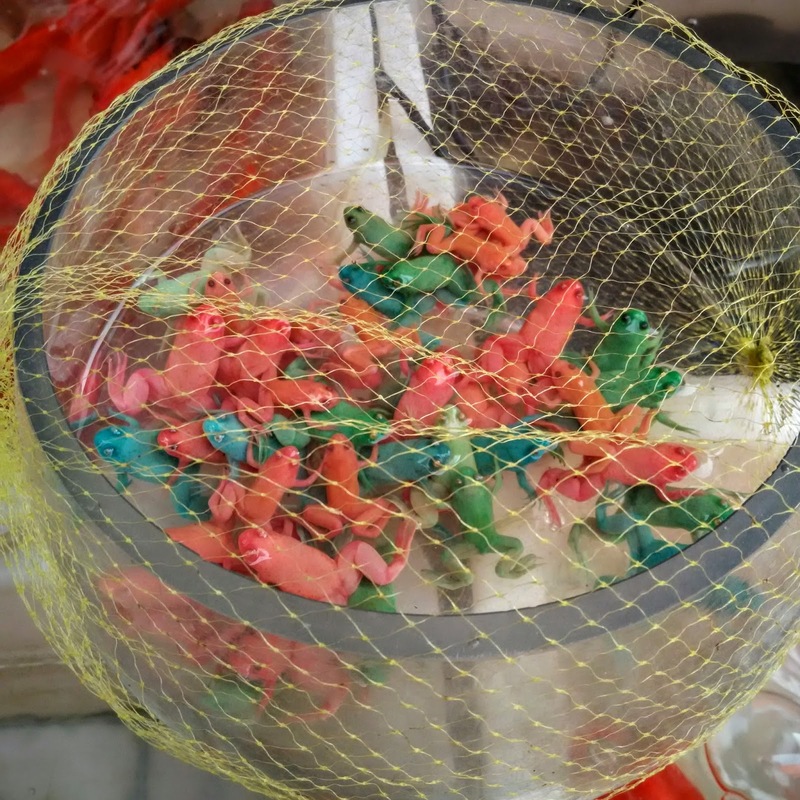 Apparently, the frogs are dyed to get them to be that unique color. Sad times. We should probably be nicer to frogs. They eat flies. That is pretty nice. Let's be nice back. 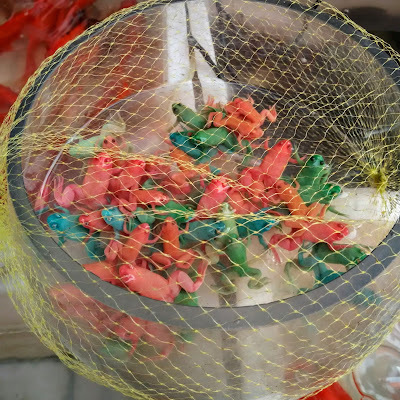 Please don't buy colored frogs. After looking at the frogs I noticed some fatty fat fish with some tiny fins. For cute! Does anyone know what fish these are? 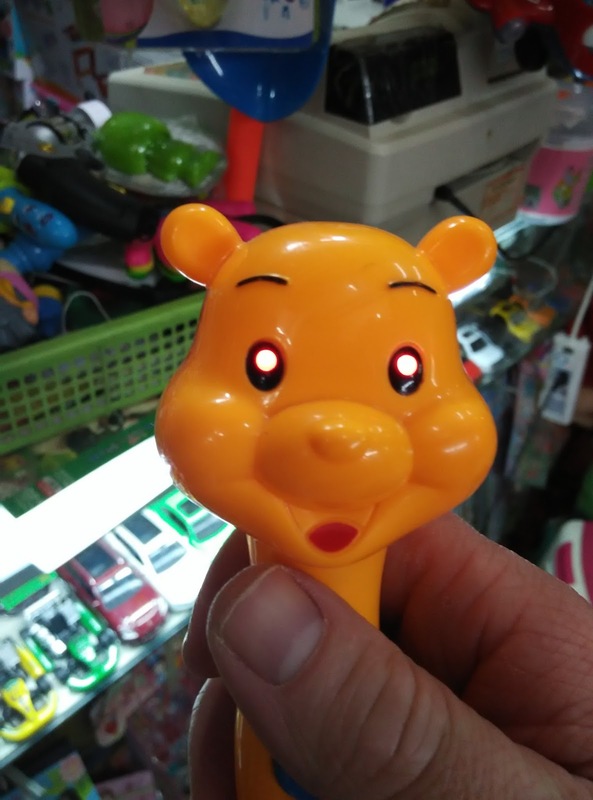 I finished my market adventure by seeing this creepy Winnie the Pooh toy with light up eyes. China is an amazing place!